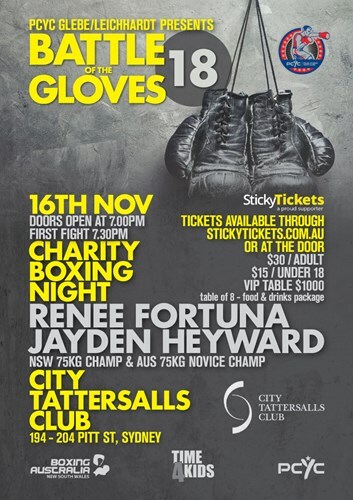 On November 16th 2018 PCYC Glebe/Leichhardt is hosting its second charity boxing night as part of our Time4kids annual fundraiser. There will be fights, food and other fundraising offers on the night. All proceeds from the night will be invested back into PCYC to support youth. Please come through and support us on the night. VIP tables include entry, seating for 8 people, food and beverages*.